Charles William Tookey 1885-1940, my grandfather, was one of 15 children born to Charles and Amy Tookey (was Mayes) in Thundersley. 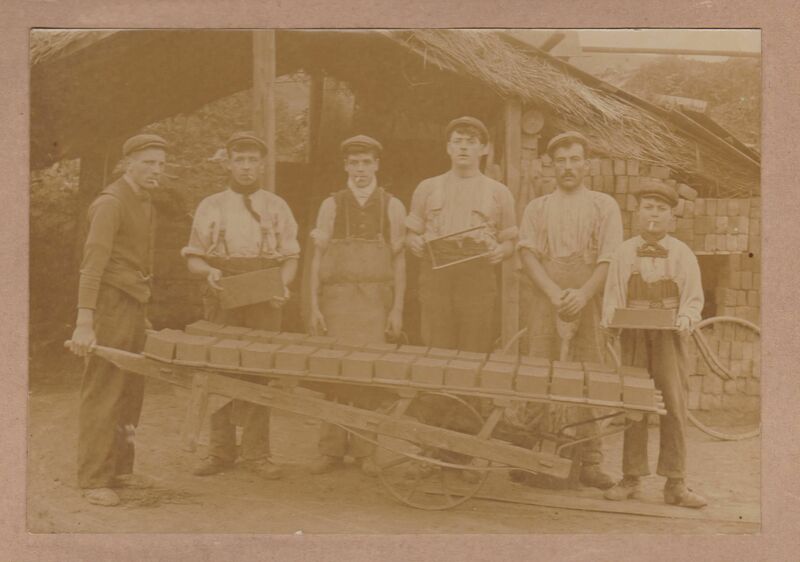 The first photo shows a group of young brickmakers; my grandfather is 3rd from the left, and looks quite young so the date is probably the very early 1900s. 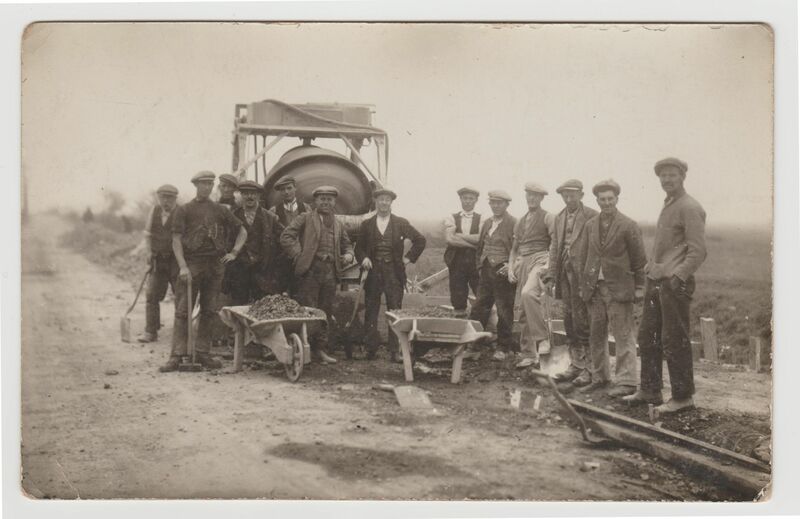 The second photo shows a road building gang; he’s 4th from the left in this photo, and is quite a bit older, maybe taken in the 1920s? The third picture shows some kind of charabanc outing, again I would guess taken in the 1920s ; my grandfather is the man with the long coat and the moustache standing 3rd from the right. 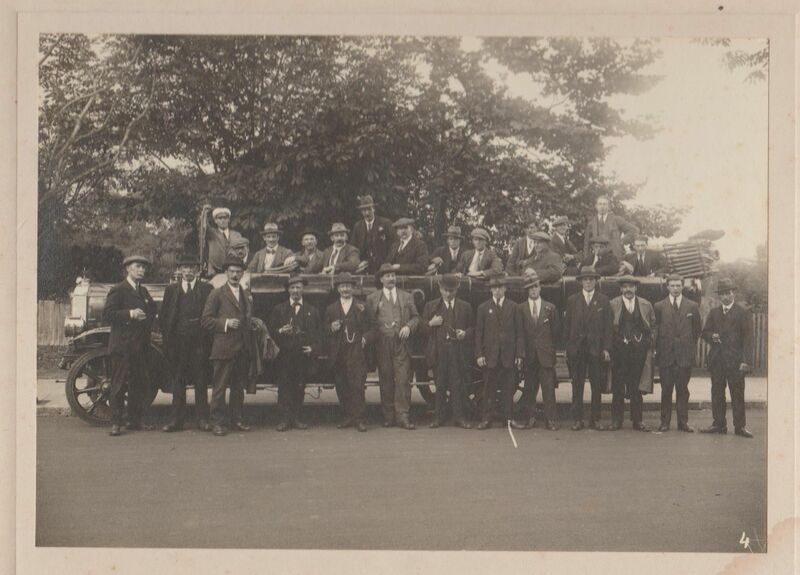 I don’t know the names of any of the other men in these photos – but perhaps someone else will recognise some of them – if so, please share! Tookeys have lived in or near Thundersley since about 1842, when three Tookey brothers moved from Leicestershire to Barling with their mother Elizabeth Shillaker, stepfather John Shillaker, and half siblings. My research on the Shillaker family seemed to confirm that Elizabeth was born 1801 in Frisby, Leicestershire and married John Shillaker in Horninghold (when about 30 years old). Her 4 sons by her former marriage, Christopher, Joseph, John and William Tookey were born between 1823 and 1831 (from Pat Tookey). In 1861, John and Elizabeth lived on Hadleigh Common with John then working as a shepherd. They were both buried in St James-the-Less churchyard.